I've always found it odd that although 'senior' word buffs get to solve crosswords and play Scrabble to their heart's content, there doesn't seem to be much around for them in the way of spelling bees. Why on earth are spelling bees restricted to children, in a world overflowing with fiercely competitive, silver-lined orthographers? 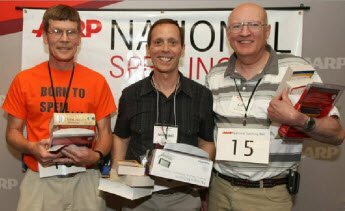 The National Senior Spelling Bee was brought into being by a group of volunteers from an organization called the AARP, in 1996. It has been generously hosted by this organization every year since that date in Cheyenne, the largest city in Wyoming. The event is open to all senior American citizens. What is a senior? For the purposes of this competition, a senior is anybody aged 50 or over. Each year, contestants travel from all over America to compete in this wonderful, social event. If you'd like to join them, you can get registration details, as well as the rules and regulations, at the National Senior Spelling Bee page of the AARP website. And if you're wondering where they get all those impossible spelling words, the official tome for the competition is Merriam Webster's Collegiate Dictionary. Speaking of that dictionary, I'm tweeting my way through it right now on Twitter! To get your daily word fix, just follow Word Buff on Twitter. I loved the 2011 report and all the helps that are available. I only wanted to tell you that I ran across a group of spellers who thought they were inventing the spelling bee 'wheel' as reported in the Rapid City Journal about the Canyon Lake Senior Center. Jeanne Hoback was the organizer and Kayla Sims was the Journal correspondent. Hopefully you can get a champion participant in the 2012 Bee. As someone who loves word games and is in the same age bracket as yourself, I completely appreciate your sentiments. The main reason I put up this 'Community Noticeboard' is to find out from others what clubs and competitions exist for us out there. Unfortunately, I don't have a list of them. The only mention of an adult (non-senior) Spelling Bee I've come across so far was the Big People Spelling Bee mentioned by Trip Payne - a puzzle maker I interviewed. If there are more out there, or maybe on the way even, I'm hoping we'll eventually find out here. So thanks for posting, and come back and check now and then! I'm not a senior. I wish there were adult spelling bees for adults of all ages. I love foreign languages. Are there any adult spelling bees for non-seniors? I am 42. I love mellifluous verbiage. It is very demulcent & scintillating. Join in and write your own page! It's easy to do. How? Simply click here to return to Community Noticeboard.